''I had no plans whatsoever to get into Rap. It happened accidentally, but it must have been meant to happen cause we did it so well.'' - Jalil of Whodini. In the pantheon of rap royalty that includes the likes of Run-DMC, The Beastie Boys and Public Enemy, Whodini is often mistakingly overlooked. Embodying the essence of a Hip Hop group, the trio simultaneously managed to appeal to a wide variety of music listeners and act as the poster children representing a new sound and attitude in urban music. Now, their debut album is finally remastered and expanded for the digital age. 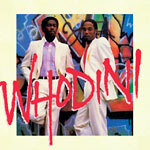 Packaged in a mini paste-on style jacket replicating its original vinyl release, Whodini's self-titled debut includes the hits ''The Haunted House of Rock,'' ''Yours For A Night,'' ''Rap Machine'' and the Thomas Dolby (of ''She Blinded Me With Science'' fame) produced ''Magic's Wand,'' all of which are dance floor classics, propelled by their synthesizer and drum machine heavy beats. Get ready to experience a groundbreaking album in flawless hi-fi stereo sound like you've never heard it before.